After it seems, a month of snow, today the sun came out, kind of!! I heard good reports from guests at lunch on how good the conditions were and headed out about 12.30 for quality control. It turned out to be one of the best days of the winter. The temperature dropped as you went up and the snow was nice and light and fluffy. They had reported only about 8 cms of new snow but it was definitely more than that. Probably about 15 cms in most cases. And with better visibility, nobody on the hill and fresh powder everywhere you looked it doesn't get much better. I finished off the afternoon with a beer in the Eagle's Eye Restaurant at the top of the mountain with some of our guests. Here is my video from today. Yes, another big dump of snow overnight. The resort reported over 20cms and it was snowing most of the day. It did warm up though to about 2 C, so the snow was getting heavier as the day progressed. But lots of snow. I went up for a couple of runs in the afternoon and was surprised by how busy it was. Probably the busiest Sunday I have ever seen. But it was only about 20 minutes at the gondola, so not a big deal. Here is a quick video update. The snow just keeps coming. Another 19 cms overnight and about 90 cms in the past Week. Blowing and snowing this morning and they are blasting like crazy up top. It has been snowing big-time for the past few hours. Walked out into our parking lot and must be 20cms of new snow. It snowed most of the day. Not a lot in the morning but as the day progressed, it got heavier and heavier. I went out skiing with a guest in the afternoon. Visibility was limited but the conditions were really nice. Wind was blowing pretty hard at times, but the snow was filling in the low spots. We did double header and it was really sweet. Ended up the day going for a snowshoe trip which was fantastic. Snowing heavily. We in the midst of a corporate retreat. An Oil company from Calgary and they are holding their retreat here all week. Meetings in the morning and then the afternoon to play. Tomorrow they are going snowmobiling. They love our hill. We have Caroline Green cooking the evening meals for them all week. Wow...what a feast. I won't be going hungry. Here are some photos from last night. More snow in the past few days. Nothing major but 7 or 8 cms each day and now the weather has warmed up. It was only about -5C yesterday and the skies cleared. Beautiful day. I went up of a couple runs about 12.30 or so. I made my first run into Feuz bowl and was really surprised that I was still finding boot-top powder. I was then headed over to the opposite side of the mountain to Super bowl when I decided to climb up to the top of T1 and go into Super bowl. It was a tough climb for me. And although there was plenty of snow, the conditions were a little wind-blown. So after the tough climb, I didn't have much left in me. But certainly a great challenge to do it and a nice way to end the weekend. More snow predicted over the next few days with warmer temperatures. Some of our colder days so far this winter. It dipped down to about -14C for most of the day here at Vagabond Lodge. Pretty good considering Banff was at -26C. -14C is still skiable. I went up in the afternoon with some Australian Guests for a few runs and the conditions were really good. All our guests are from Sydney Australia. We have had about 47 cms in the past week. One of our guests was at the original Vagabond Lodge in Leysin Switzerland in the early 70's. Friends of ours joined us last night at Peaks Grill in the plaza for dinner. Peaks makes some of the best burgers around. Lots of fun with good staff. Then it was back for a nightcap around our fireplace with our guests. It snowed all night here at Vagabond Lodge and the resort is reporting 20cms of fresh powder. Yesterday I went for a few runs in the afternoon. It was snowing lightly all day with about 6 or 8 cms of snow. I did some ski testing with a new salomon ski which has a different type of style. I tried it on a number of different snow conditions. Here is my video from my afternoon. Another treat yesterday, although I didn't get up skiing. I took Helen the wonderdog for a snowshoe instead. We got about 14 cms of new snow on the mountain the night before. And then for the most part it was sunny skies. Beautiful day. We have a group of Swedish guests who checked in last night. Some of have been here before. This trip there are 9. They will ski here until Saturday and then they are heading heli skiing with CMH. Skiing here before heliskiing is a great way to do it as there probably isn't a better hill to warm up on, than Kicking Horse. A neighbour of ours (former guests) Jeff and his son Corey hiked up to T2 yesterday, which is the most southernly run on the resort. It is about a half hour hike and quite spectacular. Here is what is looks like from the top. Great day on the slopes yesterday. Some sun which was nice. I went in the afternoon with Guests David and Bob from Los Angeles into Super bowl. We climbed up the ridge for about 10 minutes until we couldn't climb. We started sinking up to our waist in the snow. It was nice knee deep powder. Sad news later in the evening as we found out a skier from the US, got buried by an avalanche out of bounds and died. Super dangerous right now for avalanches. Sunshine today but more snow on the way tomorrow according to the experts. Here is video from yesterday. Crazy Day yesterday. Snowed all day. I went up with friend Don and two of our guests, Bob and David from Los Angeles for a few runs in the afternoon. Great conditions. Not great visibility though. 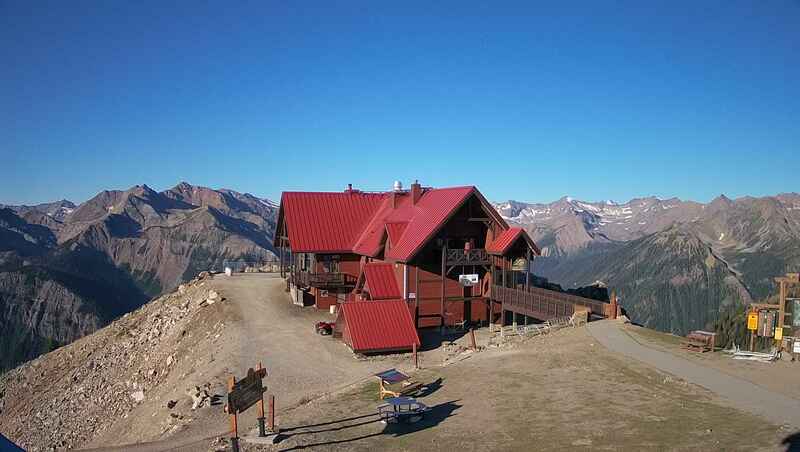 We had to stop off at the Eagle's Eye Restaurant at the top of the mountain for a beer to finish off the day. When we got down to the bottom, it began to rain. It poured pretty good for a few hours and I was thinking..oh, oh. But this morning found out they had 15 cms of snow at the top and it snowed pretty well all the way to the bottom. I went up in the afternoon with the same crew and we headed into Feuz bowl. Horrible ride on the Chairlift with the wind howling and visibility was almost nil. But once we got into Feuz bowl we found knee deep powder. Awesome. And except for a the last few seconds, where it was a little icy, conditions were nice all the way to the bottom. Here is my video from yesterday. Today was even better, just to give you an idea. It snowed most of the day, so tomorrow will be another sweet day.